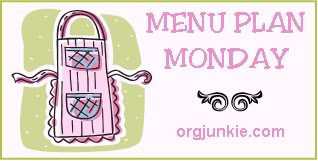 Part of Organizing Junkie's Menu Plan Monday. Oh, dear - I've got the same problem! It seems like I've been TRYING to get the freezer emptied for MONTHS! I honestly have no idea what's still there, but it just never seems to go down. . . I have one of those pantries and freezers too. Your french toast recipe sounds really yummy.